Ballymena United boss David Jeffrey knows his side will face a fired up Portadown team in the Danske Bank Premiership at Shamrock Park tomorrow. AndSky Blues manager Jeffrey knows what to expect when the two sides meet. “We played them last year and they came to our place and beat us easy. “They are fighting for their lives and with regard to the situation they are in, and there is no clarity over the points deduction thing. “They are playing assuming that they won’t have the points reinstated, so they will fight tooth and nail to win every match. “Portadown are a team that usually finishes above Ballymena in the league table. “So let us see how far we have come when we go to Shamrock Park and play in that type of game. It will be another massive challenge for us,” he added. And Jeffrey says he was a happy man after seeing his side beat Cliftonville 3-2 last Saturday. “We are looking to break into the top six and that is the target we have set ourselves. 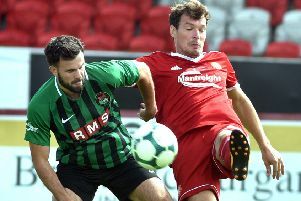 “Cliftonville are a top four side. “They had their League Cup success last year and they are playing in Europe again this year. And before his side face Ballymena - Portadown manager Pat McGibbon had praise for the team efforts on their display at Windsor Park last Saturday - but was also quick to highlight the role individual errors played in a 4-1 defeat. “Our own mistakes left it a scoreline which probably did not reflect the overall match.